Luis Suarez was a young boy already in love with football by the time his family moved from the countryside to Uruguay's capital, Montevideo. The guile and trickery of the street kid made an impact with the country's biggest club, Nacional, before he was spotted by Dutch scouts who brought him to Europe. Suarez was lured from Ajax to Merseyside by another iconic number 7, Kenny Dalglish. From that moment, he terrorized Premier League defenses, driving a resurgent Liverpool towards their most exciting top-flight season in 24 years. But there is another side to Luis Suarez - the naturally fiery temperament which drives his competitiveness on the pitch. There was the very public incident with Patrice Evra of bitter rivals Manchester United and the biting of Chelsea defender Branislav Ivanovic. Then during the World Cup finals in Brazil, in a physical encounter against Italy, he bit defender Giorgi Chiellini on the shoulder. Banned from football for four months, derided by the press, he was marched out of the country. In the summer's final twist, he became one of the most expensive footballers of all time, moving from Liverpool to Barcelona. 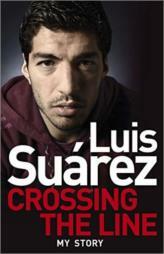 In Crossing the Line, Luis Suarez talks from the heart about his intriguing career, his personal journey from scrapping street kid to performer on football's biggest stage and the never-say-die attitude that sometimes causes him to overstep the mark.